As we welcome the Year of the Pig with a new hope for a bright new start, Macao Government Tourism Office (MGTO) cordially wishes Macao residents and visitors a fruitful and blissful year with family and friends. Best wishes also go to the local tourism industry for reaching new milestones for sound and diversified development while unleashing the enchanting dynamic of Macao as a City of Gastronomy. 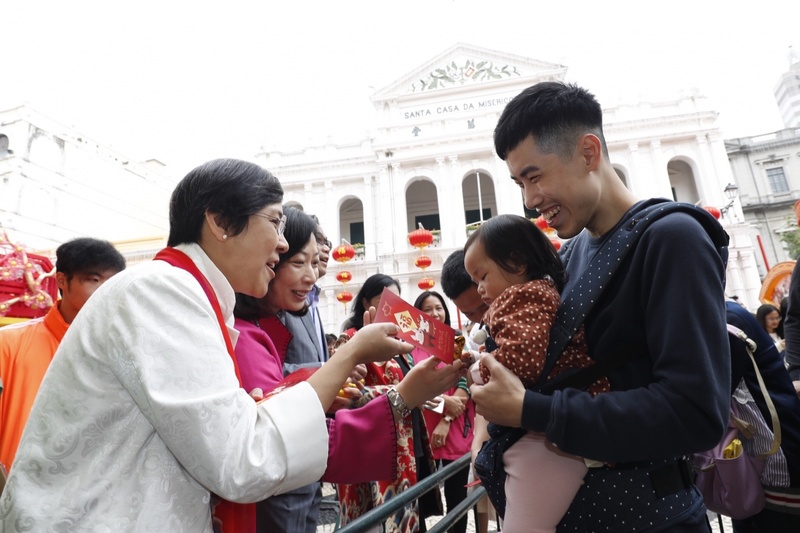 On the first day of Lunar New Year (5 February), MGTO and the Municipal Affairs Bureau joined hands to unfold Chinese New Year celebrations at the Ruins of St. Paul’s and Senado Square to share the festive joy with residents and visitors. Last year, Macao welcomed over 35.8 million visitors. 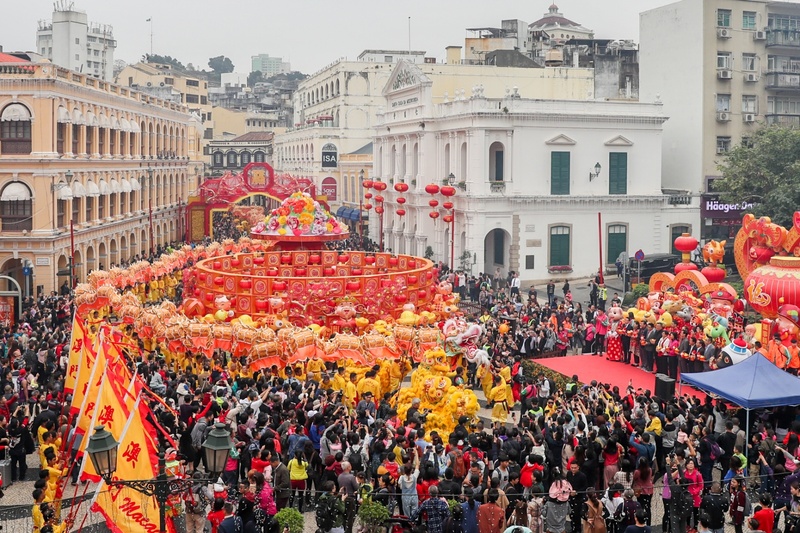 During Chinese New Year holidays, a great number of visitors are expected to come from the Mainland and neighboring regions to spend their vacation in Macao. Visitors of different nationalities also choose to visit Macao during this time of the year to experience the ambience of Chinese New Year. MGTO thus seizes the opportunity to express New Year wishes to residents and visitors and extend warm hospitality to the latter on behalf of the city. MGTO Director Maria Helena de Senna Fernandes, President of Administration Committee on Municipal Affairs of Municipal Affairs Bureau, José Tavares, President of Cultural Affairs Bureau, Mok Ian Ian, MGTO Deputy Directors Cheng Wai Tong and Ricky Hoi officiated the eye-dotting ceremony for the golden dragon and dancing lions with representatives of the local trade and other guests at the Ruins of St. Paul’s. Together they also lit firecrackers at Senado Square to kick off the celebrations on the first morning of Lunar New Year. 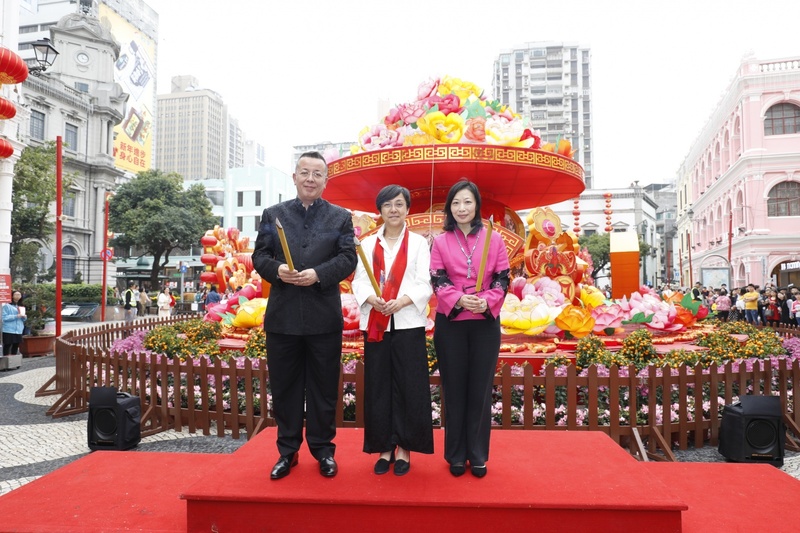 Following that, they joined the God of Fortune to distribute “Lai Si” and festive souvenirs to residents and visitors at Senado Square, filling the heart of the city with joyful blessings and a festive atmosphere. “Lai Si” given by the God of Fortune conveys the best wishes to the city for a flourishing and prosperous New Year. 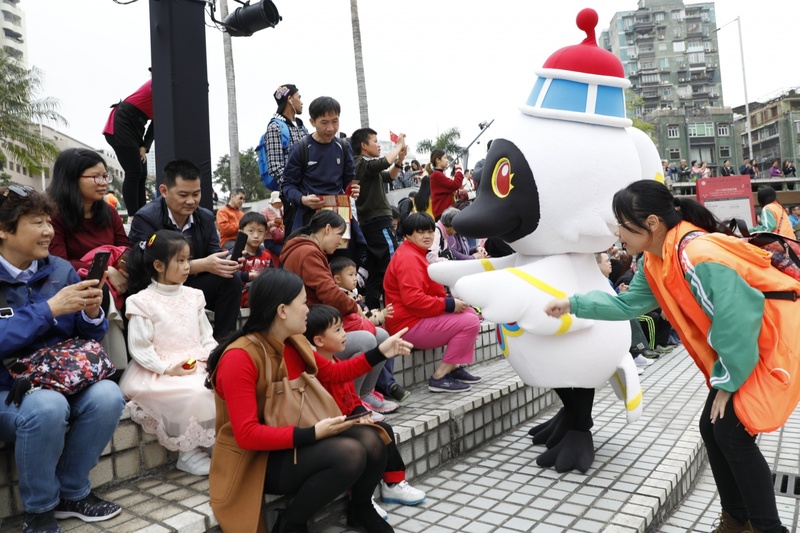 Greeting residents and visitors there as well, Macao Tourism Mascot “MAK MAK” was swarmed by kids with great fondness. 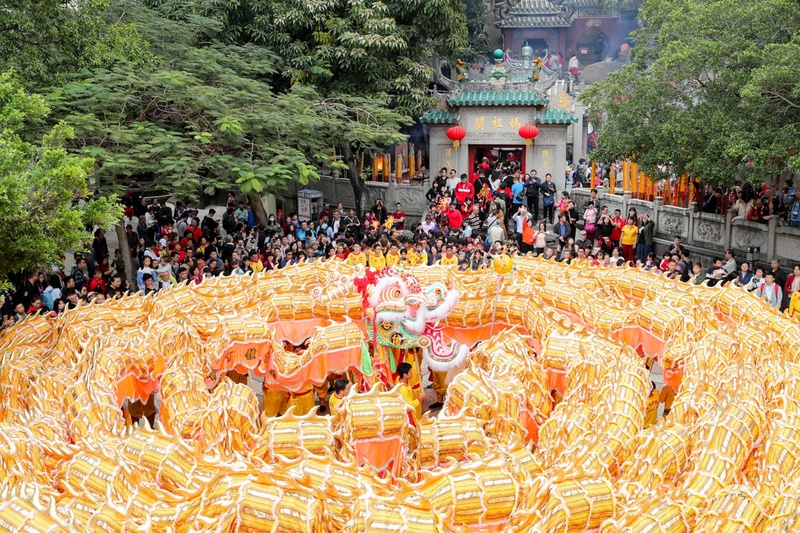 The 238-meter-long golden dragon undulated across major tourist districts on the first day of Lunar New Year, drawing many local and visiting spectators along the way. The golden dragon demonstrated vigorous moves accompanied by vibrant young lions. The lively performance carries the meaning that Macao will thrive with unparalleled vitality in the Year of the Pig and reach new milestones of development. The Chinese zodiac animal “Pig” symbolizes fortune and auspiciousness. The performance also conveys these auspicious wishes to Macao residents in the Year of the Pig as all join hands to unfold a brighter future for the city. MGTO maintains the tradition to distribute “Lai Si” to visitors during Lunar New Year. Starting on the first day of Lunar New Year, “Lai Si” containing phrases of New Year blessings are distributed at MGTO’s Tourist Information counters while stock lasts. Each “Lai Si” contains 10 cents and symbolizes auspicious wishes. MGTO will present the mega celebration event – the “Celebrations of the 20th Anniversary of the Establishment of the Macao Special Administrative Region – Parade for Celebration of the Year of the Pig” – on the 3rd night (7 February) and 6th night (10 February) of Lunar New Year, with a fireworks display on the 3rd night of Lunar New Year as well. This year, spiced with gastronomic elements once again, the Parade will be themed as “Return home for Chinese New Year”. 18 floats will represent various Chinese New Year dishes that symbolize auspicious wishes, showering abundant blessings on residents and visitors while showing the glamour of Macao’s gastronomic and traditional culture to the world. As another highlight, nine performance groups coming from different countries and regions for the Parade are giving performances in advance at various tourist spots on the first and second day of Lunar New Year. 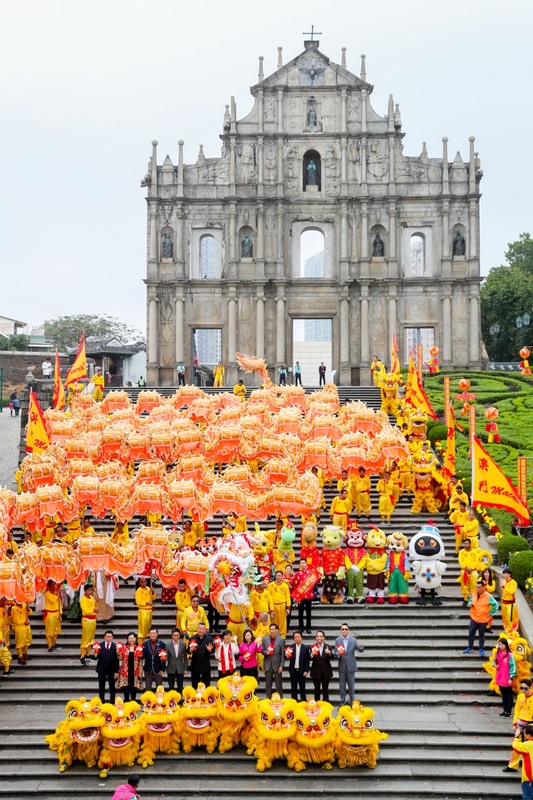 Among them, the performance groups from Hong Kong, Portugal, Mainland China and Indonesia will perform at Pak Tai Temple and the Taipa Houses on Taipa, as well as Iao Hon Market Garden and Macau Fisherman’s Wharf on Macao Peninsula respectively on the first day of Lunar New Year. 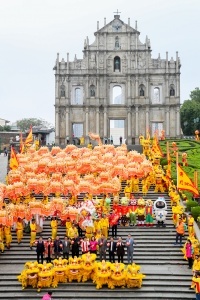 The groups from Japan, the Netherlands, United Kingdom, Slovakia and France will perform at the Ruins of St. Paul’s, Senado Square, Tap Seac Square, Anim'Arte Nam Van and A-Ma Temple on the second day of Lunar New Year. Each performance lasts for 15 to 20 minutes. MGTO rolls out an array of activities during Chinese New Year. Residents and visitors are welcome to browse the program on MGTO’s website: http://content.macaotourism.gov.mo/uploads/mgto_events_festivals/2019_CNY_Program.pdf. The Office allocates personnel at ten major tourist attractions to provide guidance and tourism information for visitors between 2 – 10 February, thus assisting in the diversion of visitors. For local dining, visitors can find award-winning restaurants and eateries listed in the publication “Star Merchant Award – Restaurants and Eateries Guide”. MGTO has also published the “Macao Food Guide during Spring Festival” (Chinese version only) together with the General Union of Neighbors Association of Macau, the United Association of Food and Beverage Merchants of Macao as well as the Industry and Commerce Association of Macau Northern District. Offering a contact list of restaurants and eateries open during Chinese New Year, the handy food guide familiarizes visitors with operation information of the relevant restaurants in Macao.